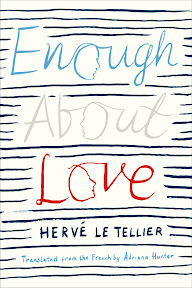 Enough About Love [Book Review] – my books. my life. Enough About Love is the story of two married women having affairs. Anna and Louise do not know each other but their stories overlap and they their new relationships begin at about the same time. They both fall in love with men who are not their husbands and we catch glimpses of the relationships – both with these new men and with their husbands – in a series of vignettes. Although it has been translated, this book still feels very French. It didn’t seem to lose anything in the translation. I still felt the emotion flowing throughout the novel as I read. I felt the struggles that the characters felt. The first chapter tells the story of one of the “other” men, Thomas, and how he grew up, what he was like when he was younger. But it does so in a detached and cursory manner so that I felt like I was watching the opening scene of a movie where the narrator explains why a character is who he is (think 500 Days of Summer). This introduction got my attention from the beginning of the book. And although the book begins with Thomas, I felt it is really the women who are the main characters, so it was a bold way to start the story. Le Tellier plays with language throughout the novel. By shifting from vignette to vignette, the author is free to try new things. For example, in one section, he has a character talking over another character’s poetry reading. He does this by using side by side columns. While Character A reads the many meanings of the french word for foreigner (and boy did the translator do a good job here), Character B has a stream of consciousness discussion with himself. *Page numbers refer to the egalley edition and may differ in the published novel. This looks good and it sounds so different. Stream of consciousness is not my favorite style, but it is okay n small doses. The stream of consciousness is just one small part of it. It doesn’t describe the book at all. I think you would like it. Lovely review, Michelle! This looks like a wonderful book! It reminds me of Roberto Bolano’s ‘The Savage Detectives’ in the way the story shifts from vignette to vignette. I will add this to my ‘TBR’ list. How did you discover this book?